Gavin Suel is Reveille IX's handler this school year. Reveille IX is in her second year as the First Lady of Aggieland. Gavin Suel is Reveille IX's handler for this school year. Reveille IX is just a few weeks into her sophomore year as the Corps of Cadets' highest-ranking member. The First Lady of Aggieland spent the summer as she will each year, bonding with her new handler. 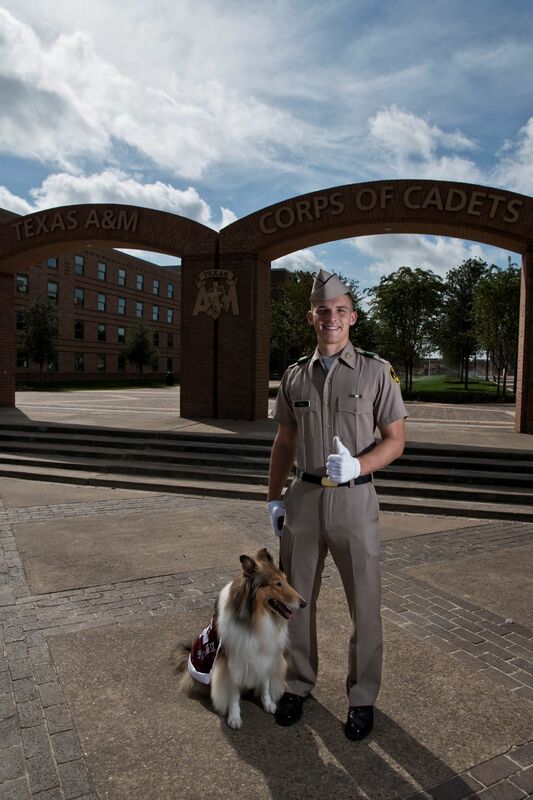 Gavin Suel, a sophomore kinesiology major, is Reveille's constant companion this year. "It's crazy how far she's come from day one to now," Suel said. "She's only 2 and a half, so she does still have quite a bit of maturing to go, but she has really exceeded a lot of our expectations in how fast and how far she has developed in such a short time." Suel said much of his work with Texas A&M's iconic mascot over the summer dealt with helping her to become more comfortable with the booming sounds and sprawling size of Kyle Field. Between cranking up the volume while listening to the music of the Fightin' Texas Aggie Band and weekly play dates on the field, Suel said he has been working to ease her nerves with the often overwhelming nature of the massive venue. "Like any dog and all of the previous Reveilles, it's a stressful environment, and it's hard on her with the noise levels," Suel said. "We want her to know that just because there is a loud noise doesn't mean that she's in any kind of danger. We've been working a lot on relaxing her and letting her know that Kyle Field and loud environments are her friends." The young Reveille is making the most of her position as A&M royalty, Suel said. An example is her request for assistance climbing into bed: Reveille will put her front paws on the bed and wait for Suel to pick her up and do the rest. And she will wait to perform a trick until she can see the treat reward. "She's the queen of Aggieland, and it didn't take her long to figure that out," Suel said. Reveille is one of the most visible mascots in the country, and will accompany Suel to class and everywhere else on campus and around town. That naturally comes with a constant stream of photo requests, which Suel says is a big part of the job. "No other mascot is so accessible to the student body as Reveille," he said. "At any time, you can see her, go up and pet her and take a picture together. That's something that really makes her special." A College Station native, Suel and his family spent the seven years prior to his acceptance to A&M as missionaries in Kenya. Though neither of his parents graduated from A&M, Suel said he grew up loving the university's atmosphere, community and traditions. Now charged with caring for one of the university's most beloved symbols, Suel said he is pleased to have been trusted with the task. "I'm really proud to have that responsibility," he said. "It's an incredible honor, but it is also a very heavy responsibility that I take very seriously. When I first got her it was pretty overwhelming, and even now it definitely keeps me on my toes. It keeps me in line, always working my hardest, always working to make sure that I don't neglect what it means or take it for granted." Reveille IX was not at all of the football games during 2016. Without Rev IX leading the team on to the field and on the sideline as our mascot, the football team lost their edge the second half of the season.